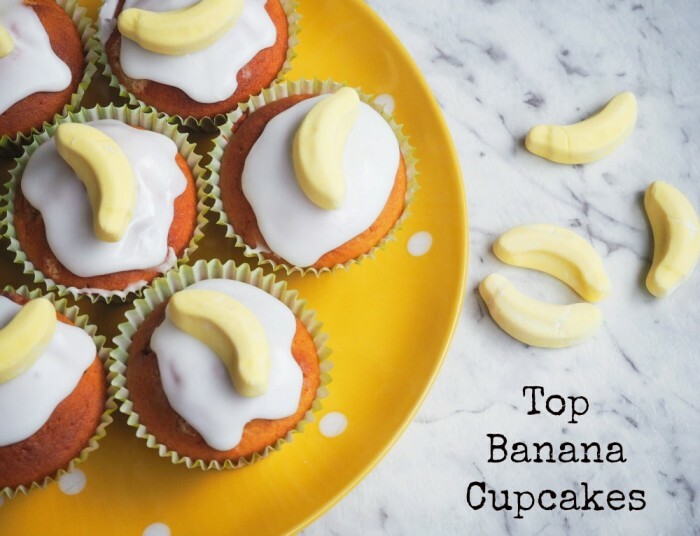 These cupcakes are so easy even I the kids can make them! I’ve given the recipe an extreme makeover with an updated recipe, some new foties and a Thermomix conversion. These quantities will make 12+ cupcakes but if you halve the ingredients you’ll get 12 neat, little fairy cakes instead. 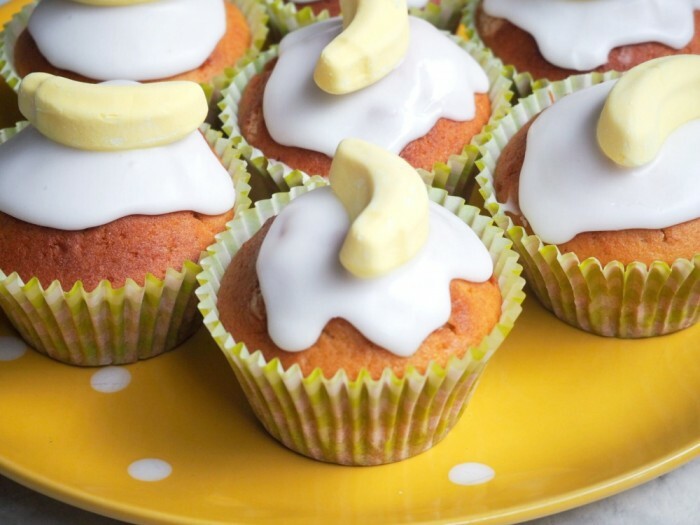 Just remember to use small paper cases otherwise your fairy cakes will be looking a bit lost in their wrappers! The beauty of these cakes is that they look cute however they’re iced and decorating them is almost as much fun as eating them! Heat oven to 180C/160C fan-forced. Line a 12 hole muffin tin tin with paper cases. Put the sugar, butter, flour, eggs, vanilla and banana in a big bowl together. Beat with an electric whisk until banana is mashed and everything mixed. Use an ice cream scoop to divide the mixture between the cases, filling each one about 3/4 full. Bake for 20-22 minutes until golden and a skewer poked in comes out clean.Allow the cupcakes to cool completely before decorating. To decorate, put the icing sugar in a bowl and gradually blend in the warm water until you have a fairly stiff icing. Spoon over the top of the cakes and decorate with sweets. You want it to be spoonable, but not too runny that it will dribble off the cakes. 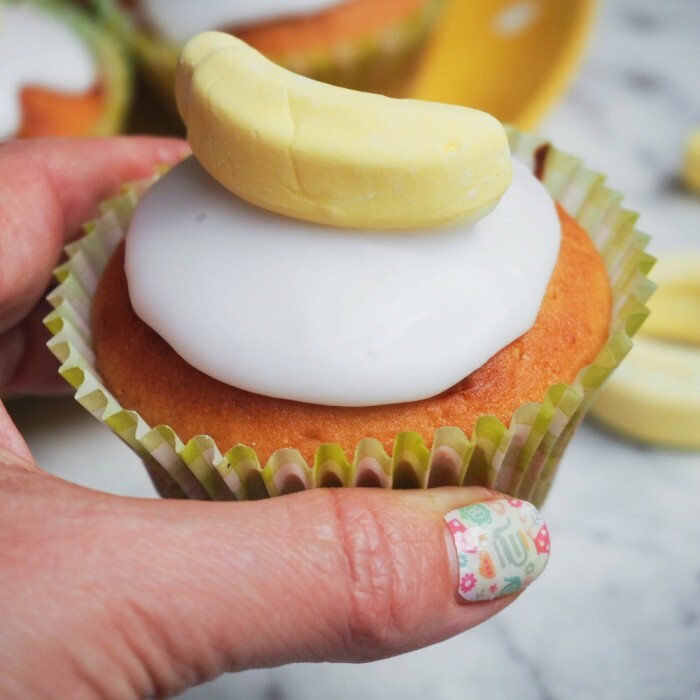 Spread some over each cake and decorate with a banana. Place the sugar and butter in TM bowl amd mix for 5 seconds on speed 6. Add banana to TM bowl and mix for 5 seconds on speed 5. Scrape down sides and base of bowl. Add remaining ingredients and mix for 10 seconds on speed 6. Bake for 20-22 minutes until golden and a skewer poked in comes out clean. Allow the cupcakes to cool completely before decorating. To store… Uniced cakes can be frozen.